Hello everyone! I hope you all had a wonderful Easter/Beginning of Spring! For those of you just tuning into the constant perplexity that is my life, aside from being an author, I am also a competitive athlete. Of course, when I say that people tend to size me and my five-foot-two-inch frame, and start guessing at what sports I could possibly be involved with. So far people have guessed softball, weight-lifting for Hobbit-esque people and most confusing of all curling. 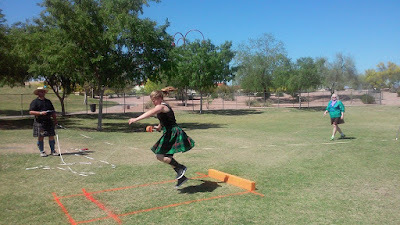 Actually, I am a Highland Games competitor. 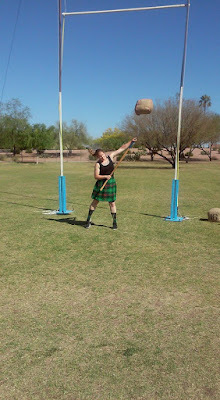 Okay, so basically I wear a kilt and throw heavy things, including giant logs (also known as a caber), in a variety of events. No really, I wear a kilt and everything. The Highland Games are a unique type of competition, not just because of their extremely Scottish heritage, but because, like the decathlon, when you sign up to compete, you don't just compete in one event, you get signed up for all of them. This means that normally you're on the field participating in a variety of events starting at 9 in the morning and constantly competing until 6 pm. However, that isn't the only thing that makes Highland Game competitions stand out. 1. 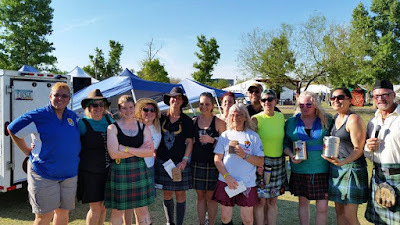 At every competition there will be at least one old Scottish clan leader (usually from a clan whose name starts with Mac) that must give a completely incoherent speech at the beginning of the games that everyone will respectfully listen to. At least six audience members will start clapping on accident because the old man has paused to remember what he was rambling about and people think he's finished talking. 2. First thing in the morning the lightweight category competitors have to weigh in, this means none of us have eaten breakfast and several of us have probably been dieting or fasting for weeks. Invariably before we can weigh in, one of the heavyweights will show up with four breakfast burritos that he or she (usually he) will eat in front of us. He will make it through at least two of his burritos before he notices all the death stares, and, through a mouthful of delicious, forbidden, tortilla and egg, ask, "What!?" 3. The event you are the worst at will always be the one that the largest crowd of people has gathered to watch. 4. There is no real way to prevent "caber bite" (when that giant telephone pole leaves little splinters in your shoulder). If you wear a sleeveless shirt you will end up with splinters. If you wear a shirt with sleeves you run the risk of the caber getting stuck on your shirt AND splinters. 5. There is always a flask of whiskey floating around, it wouldn't be Scottish sport without it. 6. You hope and pray that caber is not your first event of the day, because once you have put tacky (a sticky substance used for helping grip the caber) on your hands, you will be sticking to everything for the rest of the day. Also, do not try to give high fives with tacky on your hand, trying to free yourself from the other person is painful. 7. You had better like bagpipes, because invariably you will end up throwing right next to the tent where the bagpipers warm up and practice. Also, those pipers will, without fail, have to run through "Scotland the Brave," at least six times before the next group goes in to practice the exact same song six times too. 8. While we are technically competing against each other, no one really has a "take the others down" mentality. We mostly just compete against ourselves, trying to set new personal records and reach new goals. Even the competitors that walk onto the field and blow everyone else out of the water that you really want to hate are way too nice to actually hate. Greatest Competitors (and Judges) Ever! 9. 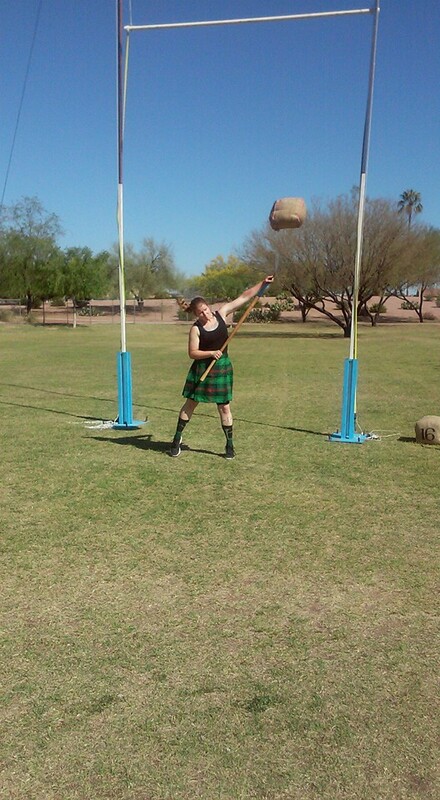 If you want to see people in kilts swear a lot, come watch them try to throw hammer when the ground is too hard for the throwers to dig in and stabilize. 10. Sometimes you accidentally create new events. 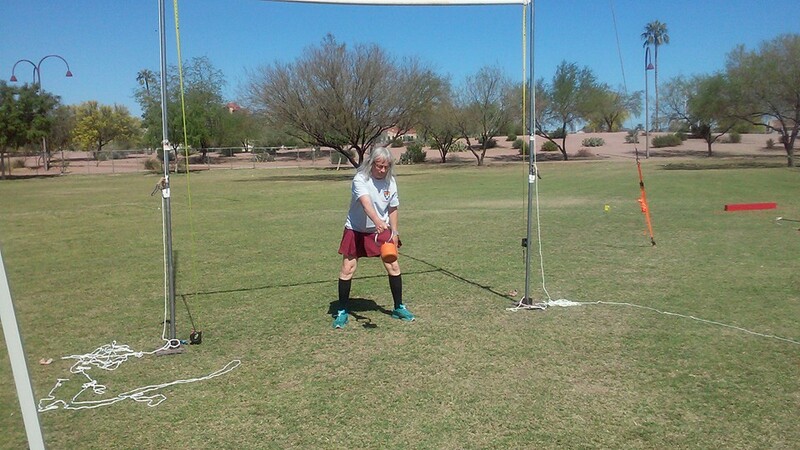 For instance, at these last games one of our competitors accidentally tossed her sheaf (a heavy bag meant to go up and over a pole) straight out to the side about thirty to forty feet. We dubbed this "Sheaf for Distance." 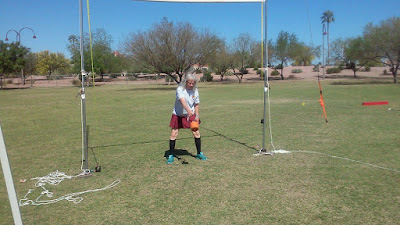 Throughout the day we also had "Weight for Distance/Bowling" and "Weight Towards Beer Tent" that occurred. This is Sarah, she is 70 years old and here she is throwing weight for height. So no excuses! 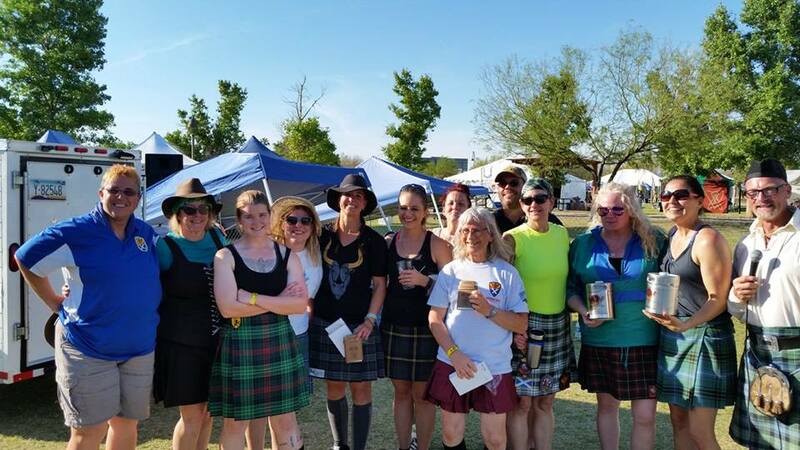 So grab a kilt, and give it a try! 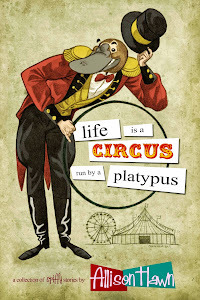 As always my adventures can be followed on Facebook, Twitter and Instagram and my books can be found here!